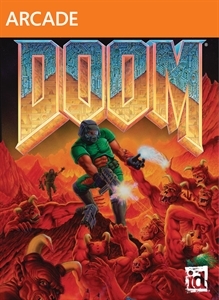 DOOMSep 27, 2006The original classic network game, Doom comes to Xbox Live Arcade. With enhanced High Defnition Graphics, 5.1 Surround Sound, and 4 player co-op and deathmatch gameplay both on splitscreen and Xbox Live. You will be able to play through the original ..
Doom 3 BFG EditionOct 16, 2012 (US)Doom 3 BFG Edition includes Doom 3 and the Resurrection of Evil add-on pack with enhanced visuals, new seven-level campaign, Doom, and Doom II. See: Doom II, Doom This game supports stereoscopic 3D. ..
Quake 2Nov 15, 2005 (US)Unlockable on the Quake 4 disc that has acheivements..
Quake Arena ArcadeDec 15, 2010 (US)id Software brings its first-person shooter franchise to Xbox Live Arcade. Quake Arena Arcade introduces the definitive, competitive first-person shooter to a new generation of gladiators. Frag up to fifteen of your friends in six gam.. RAGE: Video GameOct 4, 2011 (US)RAGE is an action game set in a post-apocalyptic landscape jam-packed with driving and shooting, created by John Carmack and the rest of the Doom crew. RAGE features intense first-person shooter action, breakneck vehicle combat, an expansi..
Wolfenstein 3DJun 3, 2009Achtung! You are OSA super agent B.J. Blazkowicz and you must escape from Castle Wolfenstein and defeat the twisted Nazi regime! Fight all of the memorable enemies from Hans Grosse to Mecha-Hitler in the legendary game that launched the First Person ..